I travelled with a girlfriend for a quick getaway Feb 18-22. We booked before the ship was in dry dock and was a bit concerned after reading all the negative reviews. Well what a surprise we had boarding to see the beautiful transformation. Decorated in creams and teals with a refreshed feeling to it. It’s probably the smallest feeling ship I’ve been on and I’ve cruised about 17 times (primarily NCL) if you’re claustrophobic the elevators may be an issue as they’re compact. 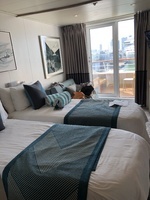 The overall feel of the ship is comfortable but I’m glad it was a 4 night cruise only. Our room was an aft facing balcony over the theatre on deck 8. Not an issue if you stay up past 10pm but if you have kids or call it an early night it&apos;s like you’re in the theatre. The room was nice but very tight with two twin beds. There are only 3 shallow drawers located in the closet but ample hanger space since we both packed light. The bathroom is the smallest I’ve ever encountered. Shower can’t be more than 24” round with very little pressure. We stayed in cabin 8078 and the carpet in the closet and at that side of the room was wet due to a leak in the adjacent cabin. Our steward was great bringing up fans and deodorizers but hopefully that has been taken care of. The balcony was a decent size though. The service throughout was pretty good with a small smattering of crew who could benefit from some retraining on customer service. The two main dining rooms were good and the service at Cagneys and La Bistro were excellent. My ribeye at Cagneys was excessively fatty but overall a good experience. Garden cafe is small but the outdoor eating area is expansive and lovely to sit out and enjoy breakfast. Food is repetitive but good. When I travel with my husband we normally opt for The Haven so this was a culture shock lol but all in all for a girls (we&apos;re in our 50’s) getaway it was great. Again I’ll say though I’m glad it was only 4 nights.